OS X Mountain Lion is the latest release of the world’s most advanced desktop operating system. Mountain Lion includes over 200 new features to update your Mac into the best computing experience yet. With the new Messages app you can send text, photos, videos, contacts, web links and documents to anyone using another Mac, iPhone, iPad or iPod touch — you can even start a conversation on one device and continue it on another. The new Share button makes it easy to share files, web pages, photos and videos, as well as tweet right from the app you are using. With the Reminders app you can create to-do lists and alerts that appear in the new Notification Center. 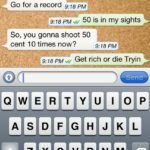 With Notes you can write down all your ideas and even speak your words with voice dictation. * Play head to head games on your Mac with friends on their Macs or iOS devices with Game Center. And with iCloud built in, it is simple to keep all your mail, contacts, calendars, reminders, notes, to do lists, music, photos, iWork files, PDFs and more up to date across all your devices. For those that purchased a new Mac on June 11th or after, an upgrade to OS X Mountain Lion is free via the Up-to-Date program. Claim your free copy here. 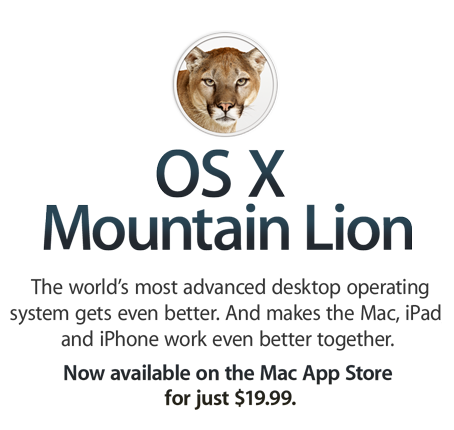 Click here to download OS X Mountain Lion in the Mac App Store–it’s $19.99.